Worcester, Massachusetts – The Massachusetts Manufacturing Extension Partnership <http://www.massmep.org> (MassMEP), a NIST-affiliated organization that helps the state’s manufacturers transform and grow their companies, has appointed a new member to the Board of Directors. Dr.Krishnamoorthy (Subbu) Subramanian, President of the STIMS Institute, fills a vacancy on the board. Dr. Subramanian is an expert in manufacturing technology, process innovation, and system approach. A former Research Manager at Norton Co. and Director of Core Technology at Saint-Gobain Abrasives, he is also an expert in abrasive tools and grinding processes. Dr. Subramanian is currently the President of STIMS Institute, a company dedicated to integrating knowledge, developing and implementing new industrial processes, and creating strategies for growth for small and medium enterprises. 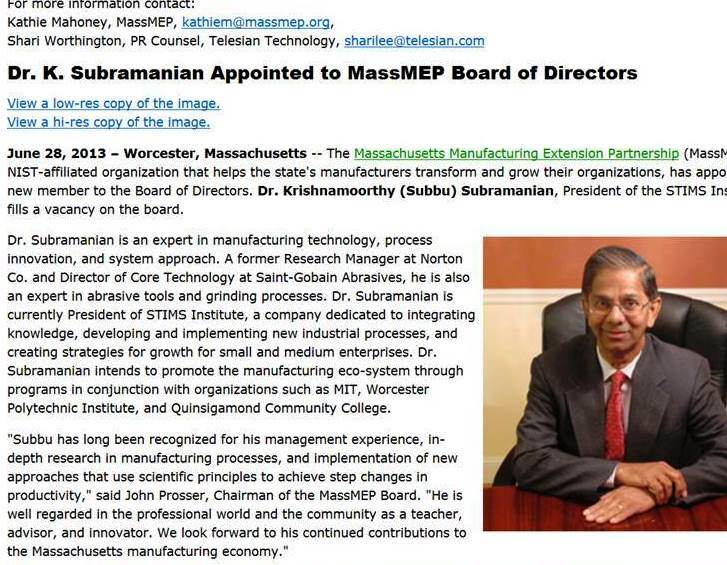 Dr. Subramanian intends to promote the manufacturing eco-system through programs in conjunction with organizations such as MIT, Worcester Polytechnic Institute, and Quinsigamond Community College. Dr. Subramanian holds more than a dozen patents and many awards, including an IR-100 Award for the invention and commercialization of a new family of ceramic cutting tools while at Ford Motor Co. A Fellow of the ASME and the SME, Dr. Subramanian is an invited keynote speaker at conferences around the world, including India, Brazil, China, Japan, and the USA. He is the author of two books: The System Approach: A Strategy to Survive and Succeed in the Global Economy and Thriving in the 21st Century Economy: Transformational Skills for Technical Professionals. Massachusetts Manufacturing Extension Partnership does not discriminate on the basis of race, color, creed, national or ethnic origin, gender, disability, age, political affiliation or belief. This nondiscrimination policy encompasses the operation of all educational and training programs and activities. It also encompasses the employment of personnel and contracting for goods and services. Next Next post: Time to re-define education, globalization.